KUALA LUMPUR: Public Investment Bank today upgraded Tenaga Nasional Bhd (TNB) to a 'buy' from 'neutral'. In a note today, it said that at current market price, TNB’s dividend yield of four per cent looks attractive. 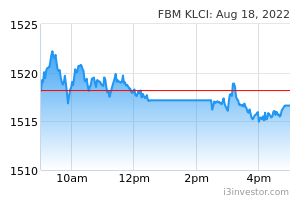 "We are maintaining our earnings forecasts with an unchanged discounted cash flow-based target price of RM14.12. "Although yesterday’s sentiment was dragged by news on Khazanah Nasional’s disposal, TNB’s fundamental remains unaffected and hence, we see the weakness in share price as a good opportunity to accumulate. "While the incentive-based regulation (IBR) framework would cap the return on TNB’s regulated assets, we believe its profitability could still be improved through cost efficiency and higher return on its non-regulated assets," Public Investment Bank said. In an announcement to Bursa Malaysia, TNB reported that Khazanah had sold 85 million of its shares, resulted in the shares to close at four per cent lower yesterday. The shares represented 1.5 per cent of its stake in TNB. The disposal saw Khazanah’s shareholding in the utility giant dropped to 27.27 per cent from 28.76 per cent, previously. It also said according to Bloomberg, the disposal of shares by Khazanah was worth RM1 billion at a price of RM12.33 per share, representing a two per cent discount to its last closing price of RM12.58. "Although we believe the disposal is part of asset value realisation by Khazanah, TNB remains a strategic holding of the Malaysian sovereign wealth fund. "Given that TNB’s market capitalisation has declined by RM18.5 billion or 21.2 per cent year-to-date, compared to a loss in revenue of RM640 million in financial year Y18, we feel the selldown is over-rated," it added. On the upcoming electricity tariffs review in June 2019, Public Investment Bank said it believed there is less pressure to hike the base tariff on residential customers due to falling coal prices. "In any case, we believe there is still remaining funds available (we estimate the savings is close to RM1 billion, after including the excess revenue collected from FY18 in the Kumpulan Wang Industri Elektrik (KWIE) to be used to subsidize any residential customer surcharge," it added. 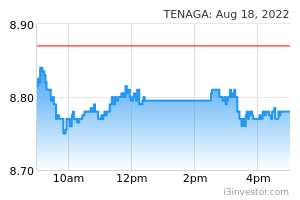 At 10 am today, TNB shares rose 24 sen to RM12.30 with 1.1 million shares changing hands.